South Carolina’s Tina Roy looks to pass inside. Photo by Nicc Jackson. Los Angeles – No. 2 South Carolina used a late-game run to escape tenacious UCLA Sunday, 68-65. Tiffany Mitchell notched 17 points for the Gamecocks, including six in the final 3:17 to seal the win for her team, which was tested by their hosts from tipoff. 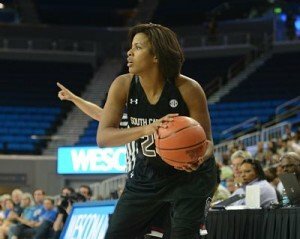 Tina Roy also had 17 points for South Carolina, and Alaina Coates added 12 points and 12 rebounds. 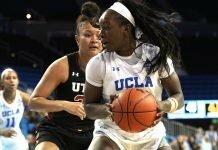 The Bruins used zone defense to limit passes inside to center Coates and forward A’ja Wilson, which caused the Gamecocks to turn the ball over repeatedly. They kept the rebounding advantage, outpacing UCLA easily. But the visitors had 14 turnovers at halftime and 21 for the game. There had been nine lead changes and nine ties by the end of the third quarter, and the two teams spent most of the fourth period knotted up. But a Wilson mid-air tip-in at the 3:50 mark put South Carolina up 60-58. 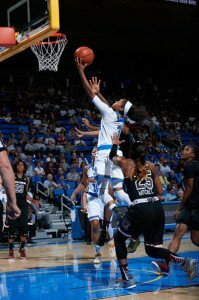 Mitchell and UCLA guard Nirra Fields traded layups, and then Mitchell scored another. Coates followed up with a bucket to put the Gamecocks up 66-60. Coates was whistled for a flagrant foul, and Bruin Jordin Canada made both free throws. But a Fields foul then put Mitchell at the line, where she sunk two. A three-point shot at the buzzer by Kacy Swain gave UCLA the last points of the contest. Canada finished with 21 points, and Fields posted 17. 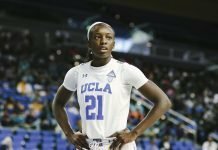 Though All-American Mitchell called South Carolina’s play uncharacteristic, she said they weren’t surprised by the Bruins’ aggression. 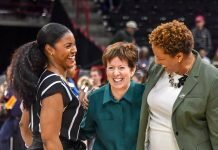 Gamecock coach Dawn Staley gave credit to UCLA. UCLA’s Jordin Canada slices through the South Carolina defense to score. Photo by Don Liebig, UCLA Athletics. Staley said the difference was how her team responded down the stretch. UCLA coach Cori Close said she was proud of her team’s performance, but added that the loss has a valuable lesson. Close said UCLA’s ability to create turnovers and then score off of them were critical, and they forced them to use their versatility. Staley said South Carolina is still solidifying its identity this season, while retaining the characteristics that vaulted them into elite status last year. The Gamecocks next travel to Hawaii, where they’ll play in the Rainbow Wahine Showdown against Arizona State, Cal State Bakersfield and Hawaii. The Bruins travel to the Bahamas, where they’ll take on Louisiana Tech in the Junkanoo Jam.